Question: Is there lead paint on the outside of my Jervis & George reusable glass baby food container? Answer: Yes, there may be. I have tested four product samples from this brand (with testing done using an XRF instrument) and all four jars had paint that was positive for high levels of lead. 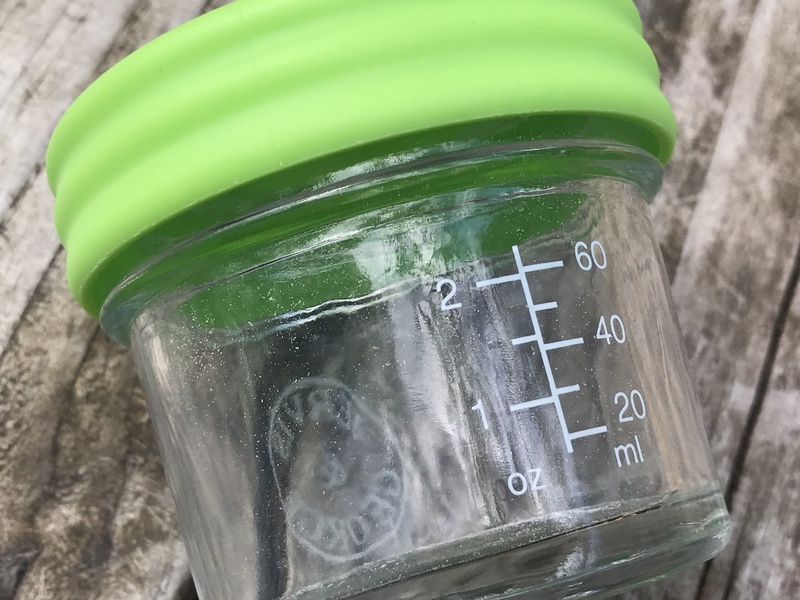 When testing the “Jervis & George” brand reusable glass baby food container pictured here (with markings to 2 ounces and 60 ml and a green plastic top), all of the white painted markings on the outside of the glass were positive for unsafe levels of lead. The amount of lead in the painted markings on this particular jar was higher than 5,000 ppm lead – a level above even the regulatory threshold (minimum) by which legacy lead paint is officially considered by HUD to be “lead paint” and far far above the modern regulatory standard of 90 ppm lead set for the maximum allowable level of lead in the paint or coating on children’s products. To share this post on Facebook, click here. TIA! The white painted markings were also positive for traces of cadmium, which is a known carcinogen. Continue reading below for specific details, context and concerns as well as the exact XRF readings for the lead levels found on the jar pictured. Click here to see a good lead-free choice! How much lead does paint have to have for it to be considered to be lead-paint? In 1978 when “lead paint” was “outlawed” (for use in residential painting applications) the maximum level of lead that was set as “allowable” in the paint at that time was 600 parts per million (ppm) lead; the paint needed to come in BELOW 600 ppm lead to comply with the 1978 regulation. Later that level was lowered to 90 ppm lead, and new house paint today (that I have had the opportunity to test) is generally negative – for even a trace amount of lead. Separately, the Department of Housing and Urban Development (HUD) allocates funds to intervene and provide lead hazard remediation in homes owned or occupied by low income families with young children if the paint is at or ABOVE 5,000 ppm lead (or the near equivalent measurement of 1 milligram of lead per centimeter squared of painted area.) Said another way, the modern threshold for federal intervention (the level at which HUD acknowledges house paint has “too much lead” and is absolutely unsafe) is 5,000 ppm lead. Meanwhile, all the other relevant Federal agencies (CDC, EPA, and CPSC) have, in recent years, finally acknowledged the long-held consensus in the scientific community — that there is actually “no safe level of lead exposure” for children, and accordingly officially adopted that language. This obviously implies that there should be no “safe” level of lead in products intended for use by children or for use with children, and so stringent regulatory standards were required to reflect this reality. Why isn’t this product illegal then? And that is where we come to this atrocious loophole that is allowing lead in the painted markings of baby food containers, baby bottles, sippy cups and other items intended for FOOD USE for children no less. To see more of my #LeadedBabyBottle posts, click here. LOOPHOLE: Because there is so little actual paint on the surface of these jars or bottles, even though the paint has an extremely toxic level of lead and even though federal agencies agree any amount of lead exposure to children is unsafe, the CPSC has maintained the position that it considers the lead paint on products like this to be “an acceptable amount of lead paint” and therefore these products are in compliance with current (ridiculously stupid!) regulations. Consumers should consider tossing these products or returning them for a refund. Read more about that here. Consumers should also make a complaint to the CPSC. To read my correspondence with the CPSC on this matter, click here. Lead-free paints are readily available and used by brands who know better (Avent, for example). Alternately markings can be made as a feature of the glass without using any paint at all. How much lead (& cadmium) was found on these jars anyway? It is also very important to note that the nature of the logo/ printing on the outside of these jars (see above image) is that the thin lines of paint don’t fill up the scope (testing window) of the XRF instrument. As a result, the reading of 5,732 is artificially lowered — given there is so much bare unpainted glass space between the letters. Were the paint to be tested on its own (removed from the glass substrate of the jar) it would likely – based on my experience – test positive for lead at levels at or above 25,000 to 30,000 ppm. I couldn’t do what I do without contributions from my readers. The cost of renting an XRF instrument to do this type of testing can be $500-$700 per day and I am still working on chipping away at paying a $5,000 XRF rental bill from earlier this year. As always, thank you for reading and for sharing. Are you a #LeadSafeMama? Get your shirt today! 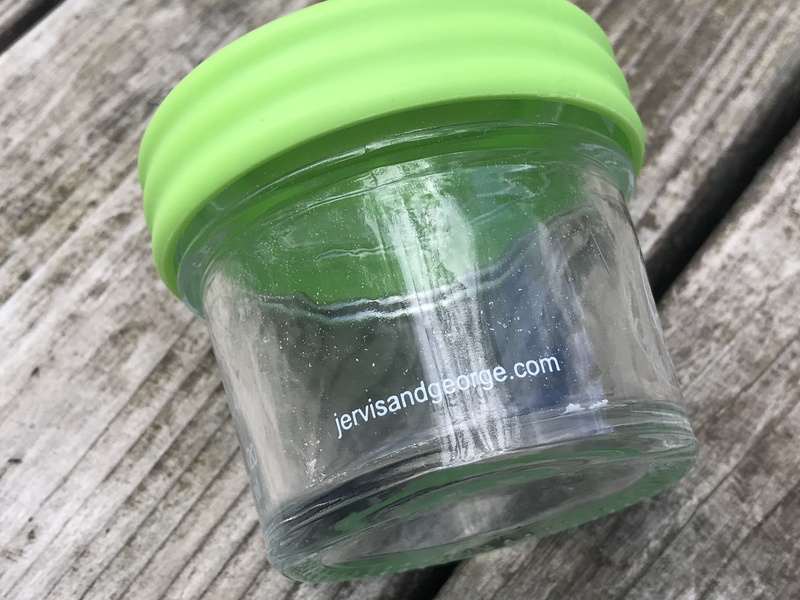 One Response to #AskTamara: Is there lead paint on the outside of my “Jervis & George” reusable glass baby food container? Have you tested any other baby food jars? Sage spoonfuls? That’s what I’ve used but I’m unsure about the paint now. I saw you linked the Ball brand with the plastic lids, but those are hard to find (only 1 left on Amazon and I can’t find them elsewhere) – trying to find a good option for sending baby food to daycare that will be microwaved there (so no plastic)!